A recent study published in AJKD by Dhondup et al provides a number of helpful insights into the progression of kidney disease in patients with nephrolithiasis. 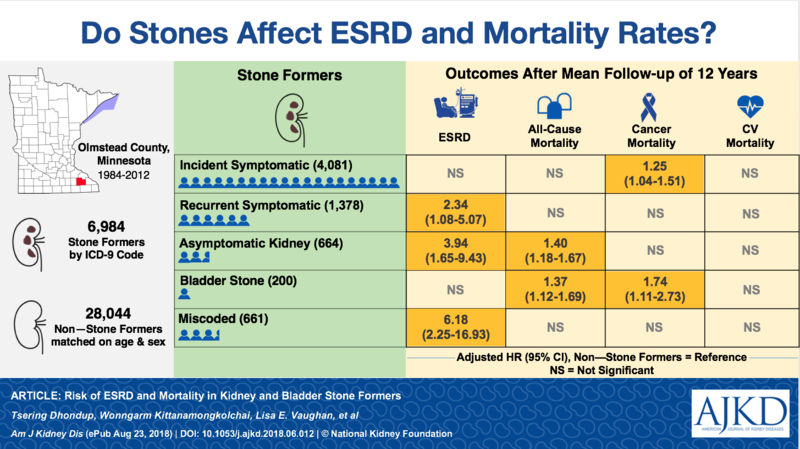 Although the economic burden of kidney stones to the healthcare system has been well established for decades, the emerging evidence to support a link to diminished kidney function, end-stage renal disease (ESRD), and possibly death emphasizes the importance of their chronic management and that the consequence of nephrolithiasis extend well beyond the intermittent episodes and the pain they produce. Figure 1 from Dhondup et al, AJKD, © National Kidney Foundation. 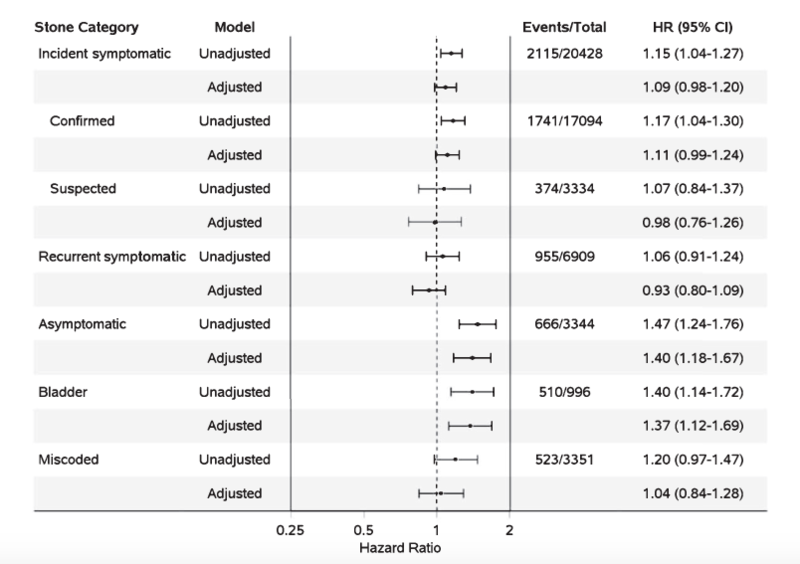 Unadjusted and adjusted hazard ratios (HRs) and 95% confidence intervals (CIs) for risk for end-stage renal disease by stone-former category. Adjusted for chronic kidney disease, hypertension, diabetes mellitus, dyslipidemia, obesity, and gout. Figure 2 from Dhondup et al, AJKD, © National Kidney Foundation. 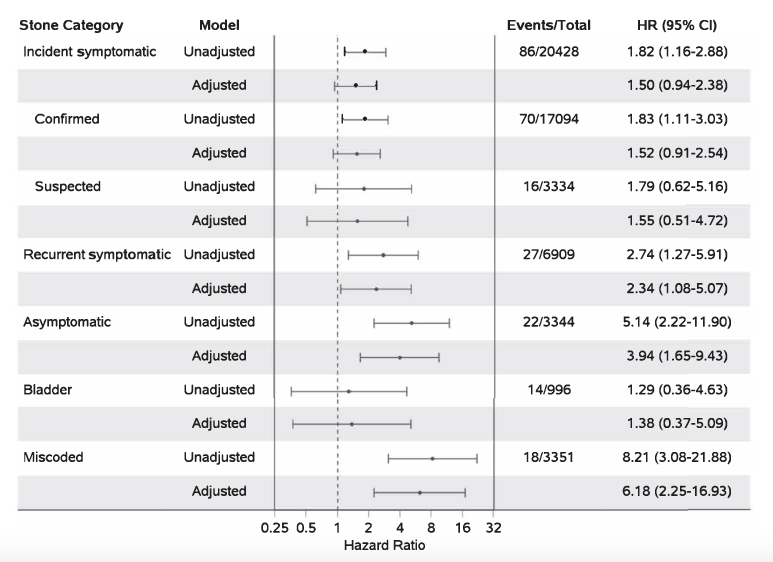 Unadjusted and adjusted hazard ratios (HRs) and 95% confidence intervals (CIs) for all-cause mortality by stone-former category. Adjusted for chronic kidney disease, hypertension, diabetes mellitus, dyslipidemia, obesity, and gout. Figure 3 from Dhondup et al, AJKD, © National Kidney Foundation. While genetic causes of nephrolithiasis have been well-described, diet and lifestyle play a central role for the majority of patients with kidney stones. Thus, it is not unexpected that the present study found a higher incidence of hypertension, diabetes, and gout in stone-formers, presumably contributing to an increased excretion of sodium, calcium, and uric acid. The finding of an increased risk of ESRD in subjects forming recurrent symptomatic stones and those with asymptomatic stones (but not in those with incident symptomatic stones) may offer an important clue as to the mechanism of injury. Though not explicitly evaluated in the study, the group experiencing multiple stone events may be enriched for subjects unable to achieve specific dietary targets (eg sodium restriction) resulting in not only recurrent stone formation but also in uncontrolled blood pressure. Additionally, recurrent symptomatic stones may have predisposed subjects to undergo a greater number of acute urologic interventions. Whether or not these procedures increase the risk of renal parenchymal damage remains debated. While transient changes in renal hemodynamics and system blood pressure have been reported after extracorporeal shockwave lithotripsy, a prospective study failed to show a decrement in renal function or rise in blood pressure after a mean follow-up of 43.6 months after the procedure. For the asymptomatic group, one might expect that many of these subjects with incidentally discovered stones did not reach the attention of a nephrologist or urologist and thus may have missed the chance to evaluate and impact dietary and other lifestyle risk factors. This opportunity for referral, diagnosis, and treatment of these stable, non-obstructed outpatients may turn out to be the most critical point to take from the study by Dhondup et al. Compared to other chronic medical diseases, the dietary and medical treatments for these patients are relatively safe, inexpensive, and effective for preventing a recurrence. Somewhat less clear from the present study is the association of nephrolithiasis with mortality. Incidentally discovered asymptomatic stones may have been more common in subjects being evaluated for malignant disease, and thus their increased mortality may have been driven primarily by the cancer diagnosis rather than the stone risk factors or the stones themselves. While bone-mineral disorders are proposed to have an association with cardiovascular mortality in advanced kidney disease, such an association was not clear from this study, as it relates to nephrolithiasis. It is possible that the proportion of subjects with a defined high bone-turnover state was too small to produce a measurable signal. Ultimately, the primary lesson from this study may be not to overlook the opportunity to intervene at an early stage of a disease process with wider reaching consequences than might have been suspected at first glance. While 50% of patients with nephrolithiasis may be expected to form a recurrent stone within the next 5-7 years, there is a suggestion that all might benefit from basic dietary counseling and risk factor modification. This simple intervention will help prevent a second stone, and may also preserve future kidney function. – Post prepared by Seth Goldberg, AJKDBlog Guest Contributor. Follow him @sgoldber99. To view Dhondup et al (freely available), please visit AJKD.org. 2 Comments on Nephrolithiasis: A Stepping Stone to ESRD? Wonderful Webpage, Continue the useful job.